Origin and Habitat: Southern Nevada, eastern California, southwestern Utah, and northwestern Arizona. Habitat: It grows on carbonate soils in rocky limestone outcrops and along limestone ridges in mountain in Pinyon-Juniper Woodland and Joshua Tree (Yucca brevifolia) Woodland at elevations of 1000-2400 metres above sea level. This species is difficult to find because they are small and occur infrequently, but occasionally may form dense population. 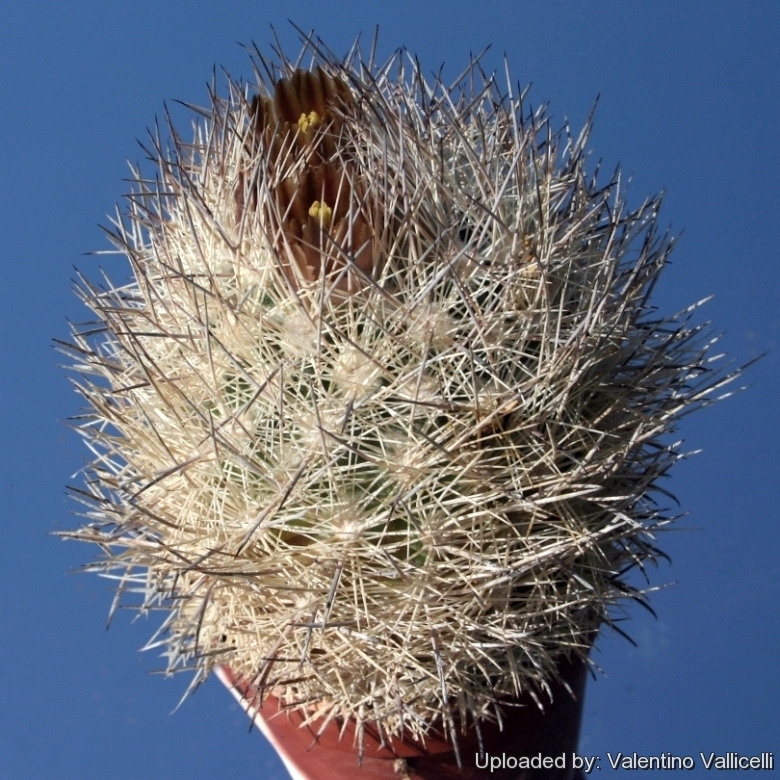 Description: The desert pincushion (Escobaria vivipara var. deserti) is one of the innumerable local or morphological form of the very variable Escobaria vivipara, however some authors (Anderson 2001) still consider Escobaria deserti a good species on its own, and not a variety of vivipara. It was formerly known as Coryphantha chlorantha. Typically it has conspicuously cylindrical stems rather than spherical flattened as in the standard Escobaria vivipara. The desert pincushion cactus usually occurs as a single stem but may be multi-stemmed. The stem is densely covered with relatively long, stout, straight white spines with reddish-brown tips, and all of the spines are pressed closely against the stem. Plants seldom exceed 15 cm in height, and the flower is small, only 15 to 25 mm broad and varies from dirty-greenish-yellow to dull rusty-brown. It is often synonymized with Escobaria chlorantha, but it is smaller than chlorantha, but spines on larger plants look similar. Juvenile plants look completely different though. This species is rarely seen in specialized collections. It has fairly modest look, even when in bloom, and pretty tricky to grow. Habit: It is a low growing perennial stem-succulent usually solitary and unbranched, but occasionally may form small clumps with few heads. Stem: Cylindrical, 8-15 cm (sometimes to 25 cm) high, 6-9 cm in diameter, densely covered with spines. Tubercles: 15-18 mm long closely set and entirely hidden by the densely matted spines. Spines: Not well differentiated as centrals and radials. Central spines: 4-6 (sometimes as many as 14), stouter than the radials, slightly spreading, those toward top of plant connivent, 12-20 mm long, black or bluish black in their upper half, shading into red, nearly white at base. Radial spines: 12-20, white except at tip, spreading, 10-12 mm long. Flowers: Small, solitary, opening in bright sunlight at the top of the stem, up to 3 cm long, 1,5-2,5(-4,5) cm in diameter. Outer perianth-segments more or less cilate; inner perianth-segments, straw yellow, dirty-greenish-yellow, rusty or brown coloured (sometimes dull pink) with a darker midline, linear-lanceolate, narrow, acute. Stigma-lobes white to greenish. Blooming season: Blooms in early summer ( in habitat from April to May). Flowers open during the afternoon and only stay open for two hours or so. Fruits: Central, green, to 2,5 cm long, juicy, bearing 5 or 6 scales near top. Seeds: Brown, flattened, 1,5-2 mm long, reticulated. 6) Franz Buxbaum: “Die Phylogenie der nordamerikanischen Echinocacteen. Trib. Euechinocactinae” F. Buxb. In: Österreichische Botanische Zeitschrift. Volume 98, Nr. 1–2, 1951, page. 78. 10) Sereno Watson, “Geological Survey of California.” Volume 2: Botany. Little, Brown & Co., Boston 1880. Cultivation and Propagation: The Desert Spinystar Escobaria vivipara var. deserti grows rather slowly and it is sensitive to overwatering (rot prone) and needs a very good drainage to avoid rotting. Repotting: It require a deep pot suited to accommodate the swollen root, repotting with fresh potting-mix should be done every other year or when the plant has outgrown its pot. However, repotting doesn't necessarily mean they'll need larger containers. Sun Exposure: Light shade when young, full sun later. Outside it likes strong sunshine, but is tolerant and do well with light shade during the hot Summer months. Tends to bronze in strong light, which encourages spine production. Hardiness: It is cold resistant to -10° ( or less depending on clones) for short periods of time. It will show its flowers only if we provide an adequate winter rest period. Watering: They require moderately watering through the growing season. This can be done weekly or more frequently during the summertime, if the weather is sunny enough, but allow to dry fully before watering again. Kept this way, plants will show a healthy growth. Keep rather dry as soon as the temperature starts dropping in october and keep it dry in winter. The plant survives outside without protection in winter but is then somewhat prone to rot, too. Propagation: Seeds, also can be grown from cutting as it branches from the base. Take cuttings spring or summer, let them dry till the ends callous well. Then replant them in fresh cactus soil that is ever so slightly moist, and keep it that way till they root. Surface sowing is the best; seeds germinate in 14-28 days at 20° C , remembering that seedlings dislike strong light and dry conditions.